I set out the moth light the other night and had a few species come in, but had many non-moth visitors – katydids, a praying mantis, lots of caddisflies, and one very interesting little guy, a weevil. Weevils are the largest family of beetles with over 3000 species in North America. They are distinguished by often having a distinctive snout (rostrum) with chewing mouth parts at the end, and antennae part way down its length. They are plant feeders of one sort and many are considered agricultural pests, but, they sure are interesting and crazy-looking creatures. The Kaufman Field Guide to Insects of North America states that hardly any plant is not affected by at least one species of Curculionidae. My visitor the other night looks like one of the acorn weevils, Curculio sp. They are tan to brown with a long rostrum and spurs on the femurs of their legs. 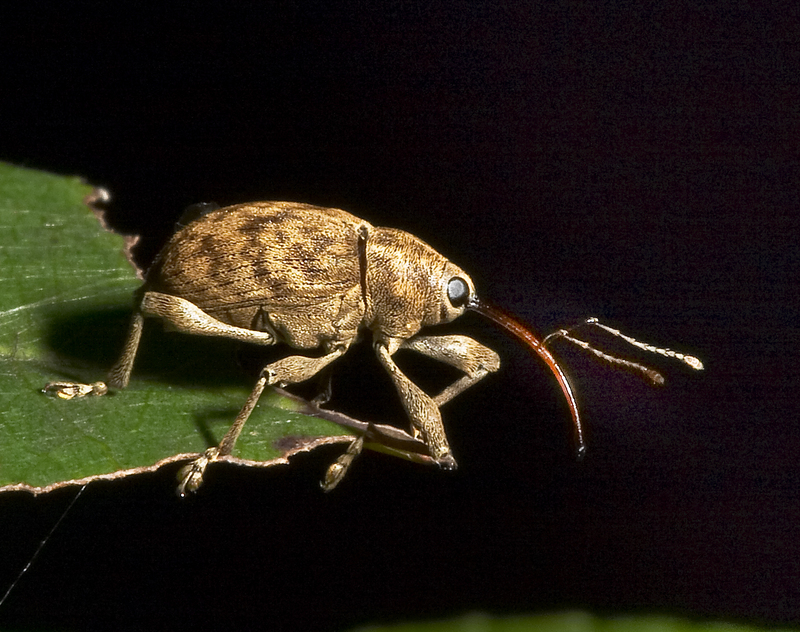 Weevil antennae are elbowed and can fit into a special groove in the snout. I am guessing this may be a female since they tend to have longer snouts, at least as long as their body. So, she has probably been using the mandibles at the tip of that “nose” to chew holes in some of the many acorns out back. She then turns around and lays an egg into that hole. 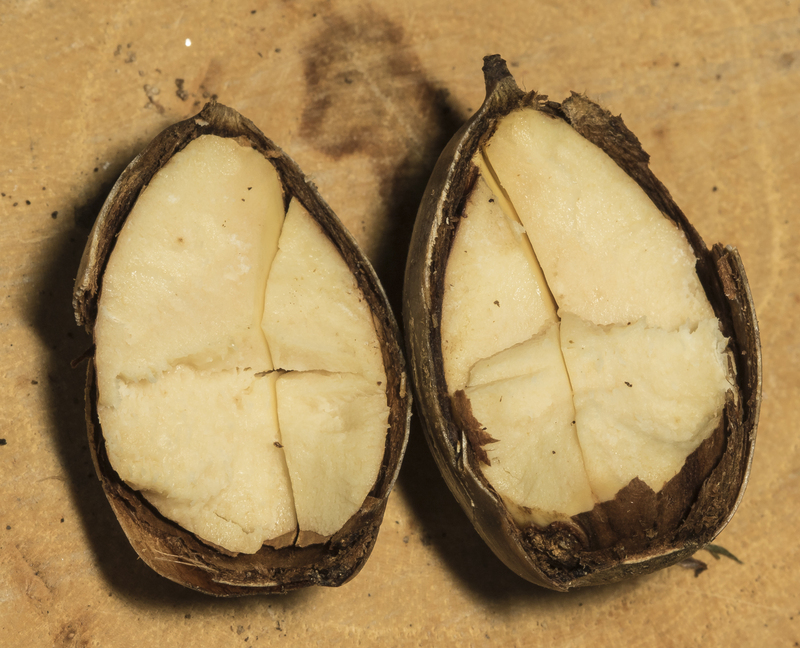 Her baby will feed on the meat of the nut and then chew its way out and pupate in the soil once the acorn falls. 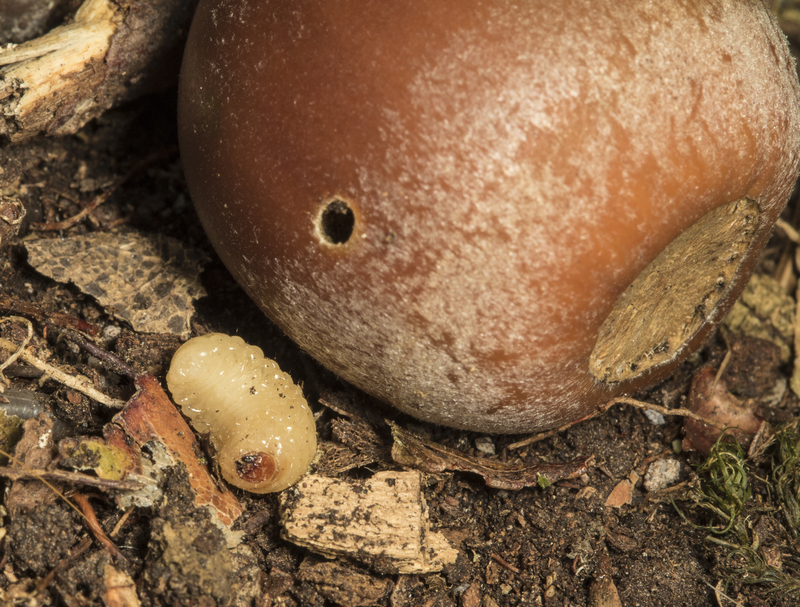 I reported on the fascinating grubs of acorn weevils in an earlier post. No matter your opinion on the dietary costs of weevils, you gotta admit, they are one odd-looking, and some may even say, cute, critters. Each year insects heavily attack northern red oak acorns and destroy a large percentage of them, greatly reducing the number of acorns available to produce seedlings and feed wildlife. No, this isn’t what you think…it really is a post about acorns (I need a break from the other nuttiness). It is a quick follow-up to my recent post on acorn weevils. I became fascinated with the goings-on inside acorns after seeing the weevil larva pull itself out of the nut and wanted to learn more. 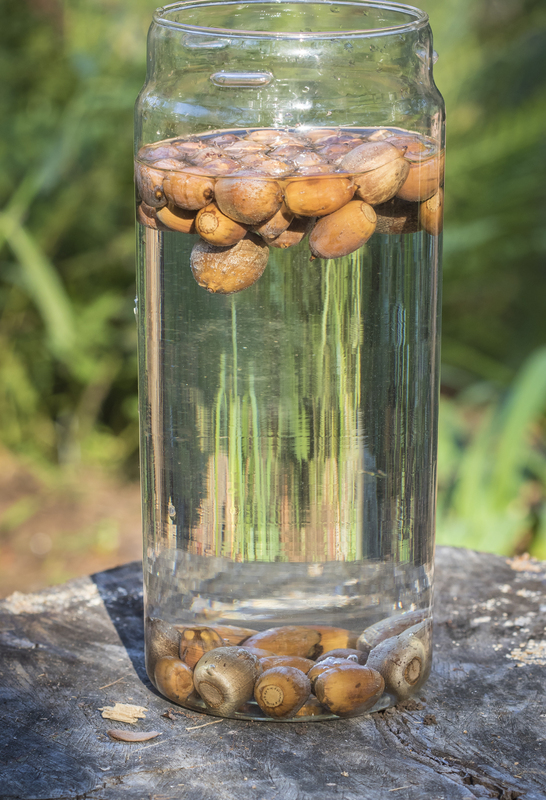 I collected 100 acorns and did the float test I mentioned in that first post (I used only white oak acorns for this test although the photo above shows both white and northern red oak acorns). An astonishing 45 out of 100 acorns were floaters, indicating they were “unsound”, which means they possibly had acorn weevil larvae or some other insect inside. I separated those out and placed them in a plastic tub and have been collecting the larvae that emerge. In the last week, 13 insect larvae were found crawling around in the tub. Most were the large chubby weevil grubs I found before, but a few were different. 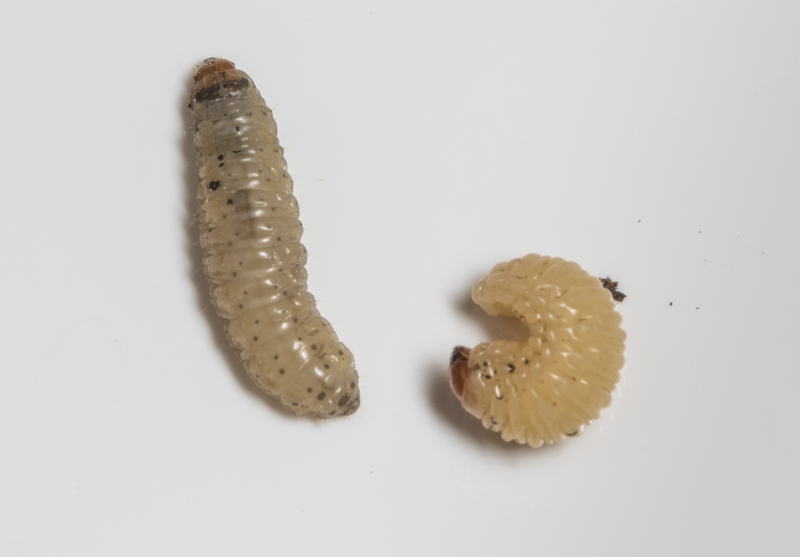 The photo above shows samples of the three types of larvae that have emerged…the large weevil grub on the right; a much smaller weevil grub in the middle; and a moth larva on the left. 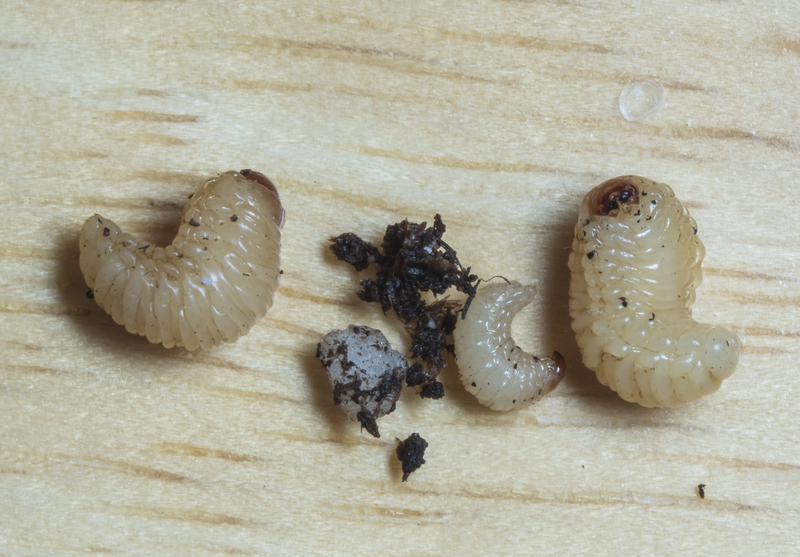 A few of the grubs were small versions of the chubby acorn weevil larvae. These may be from a different species of weevil rather than simply smaller versions of the dominant larvae I have seen. 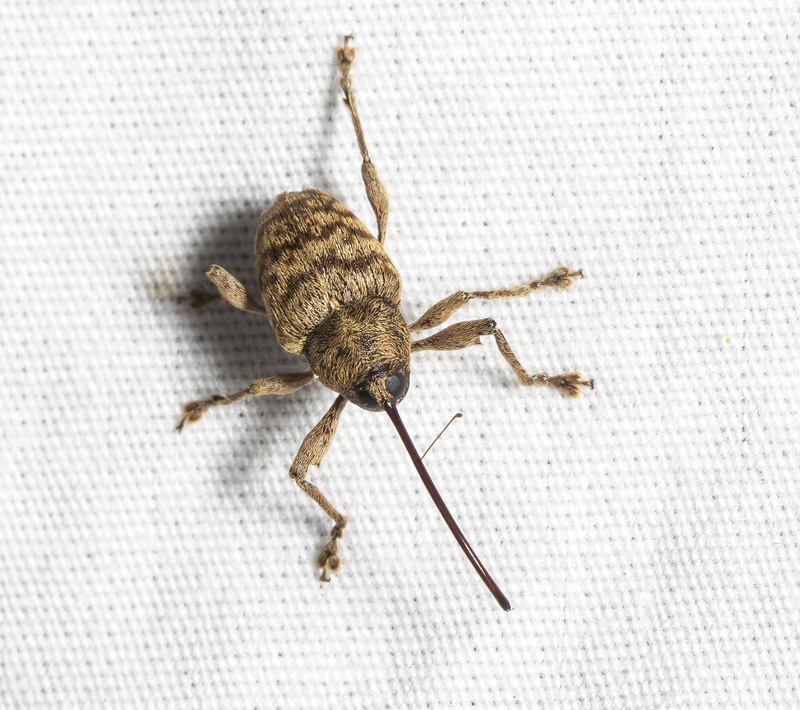 Online resources state there is another acorn weevil with a short (less than half its body length) rostrum that lays its eggs in acorns that are on the ground (the species I showed in the last post, with the long rostrum, lays eggs in developing acorns on the tree). And it appears there may be more than one species of weevil that lays eggs in developing acorns, so the small larva shown in the middle above could certainly be that of a different species. There was also one caterpillar that crawled out of an acorn this week. From what I can decipher from scattered references, there may be a couple of species of small moths that lay eggs in acorns. 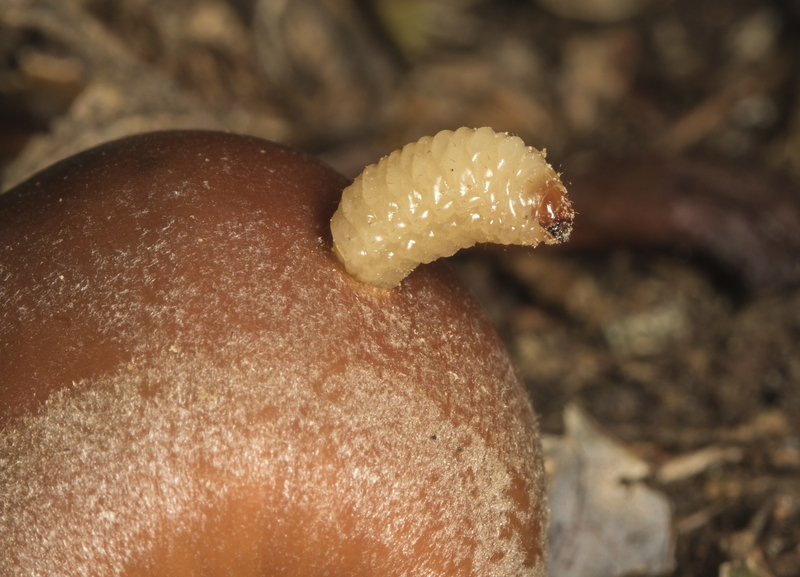 The information I found suggests they lay eggs into existing cracks or openings in acorns (including the exit holes of acorn weevil larvae), although one reference also stated at least one species of moth caterpillar can chew through the shell of an acorn. 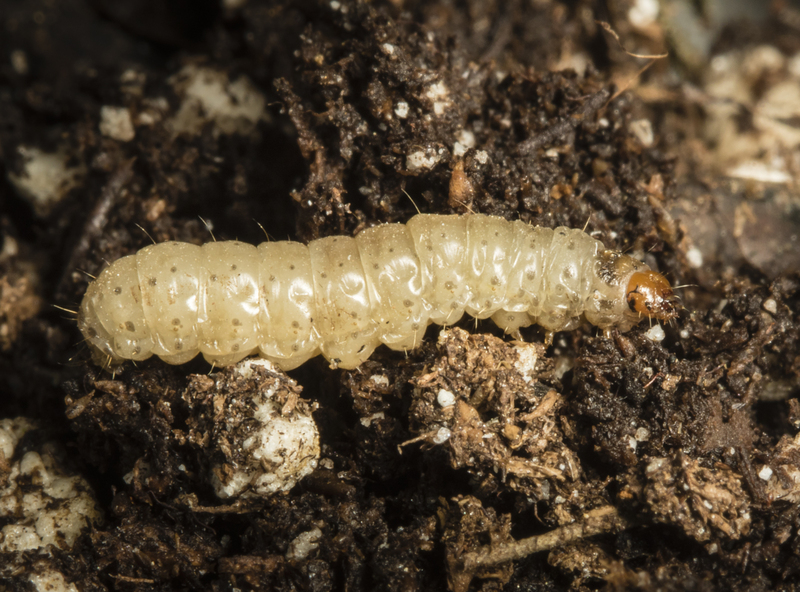 The moth caterpillars are easily distinguished from the weevil larvae by their more elongate shape, and the presence of three pair of legs just behind the head capsule (the weevil larvae lack legs). I placed several of the insect larvae in small containers with potting soil and hope to rear them to see what emerges next spring (or whenever since some may take more than one year). 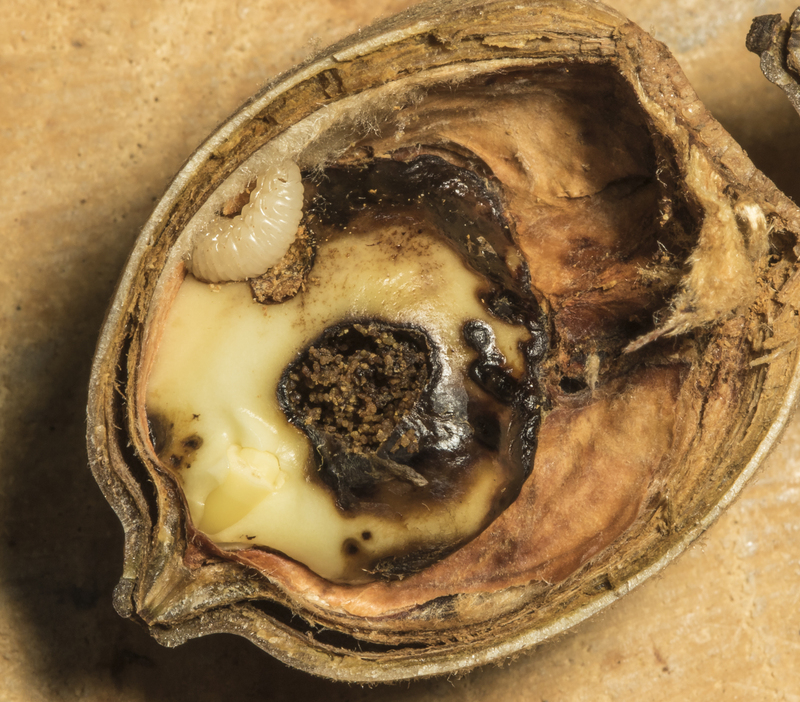 The literature indicates a wide range in the percent of any years’ acorn crop that is infected with insect larvae, depending on location and oak species. 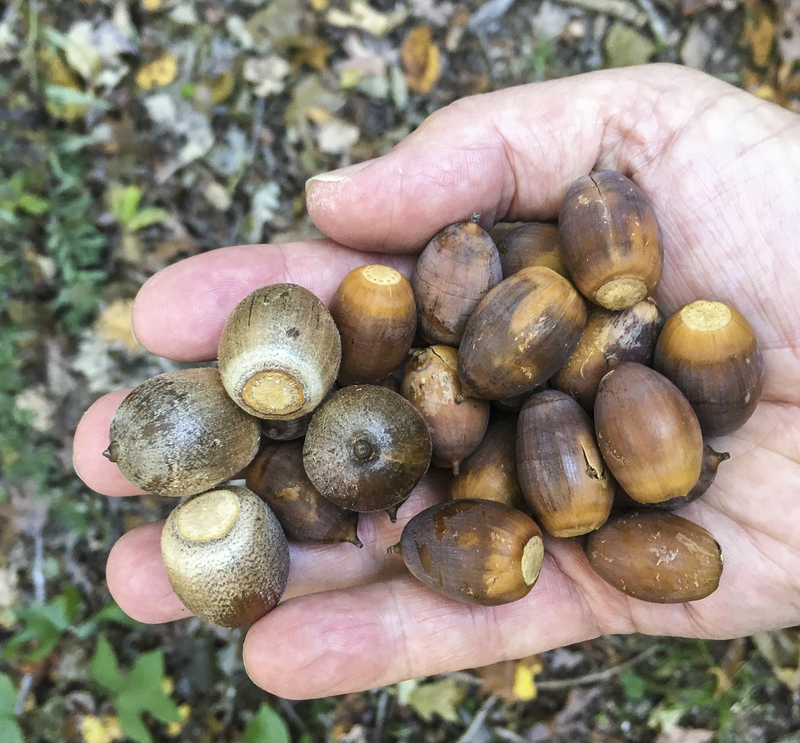 The study cited in the opening quote found an average of 52% of the northern red oak acorns at a site in Ohio were damaged by insects of various sorts. My very limited “study” indicates 45% are unsound. And it’s not just in acorns. 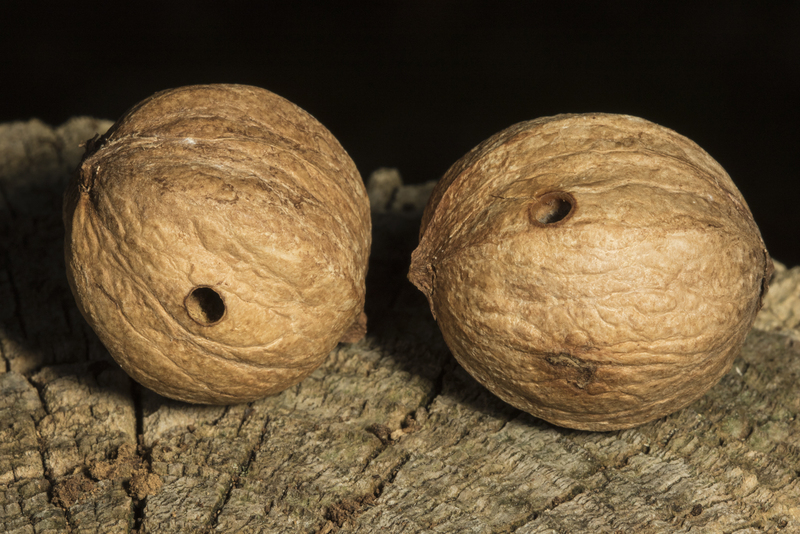 It is also a good year for the hickory nuts in our woods, and, much to my surprise, I am finding a small percentage that have very neat exit holes in them. These nuts have much harder and thicker shells than acorns, so it will be interesting to see what is making them (I am assuming a weevil larva of some sort). Seems like there are some pretty amazing things going on out there in the forest. I am looking for acorns these days, to sow on the Walden lot, but can find very few sound ones…I found by trial that the last or apparently sound acorns would always sink in water, while the rotten ones would float, and I have accordingly offered five cents a quart for such as will sink. In spite of this fact being around for over one hundred years (at least), I found out about it only after I started working at the museum 20+ years ago. But, first, let me explain my introduction to the creature that is often the cause of this phenomenon of the floating acorn. I was preparing a lesson for a class years ago and decided to do something on acorns (it was a very good mast year that year). I collected a batch of acorns from a couple of different oak species and was going to have students observe and sketch them. I placed the nuts in a pan and after a couple of days, I noticed some movement in my acorn stash…small, chubby little grubs. There were a lot of them…what the heck were these things? I quickly learned they were the larvae of the acorn weevil, Curculio sp. Weevils are one of the largest families of insects, with over 2500 species thought to inhabit North America (that’s over three times as many weevils as there are species of birds that breed on North America). True weevils are generally small beetles (less than 1/4 inch) with a long snout (rostrum) that remind some of the trunk of an elephant. 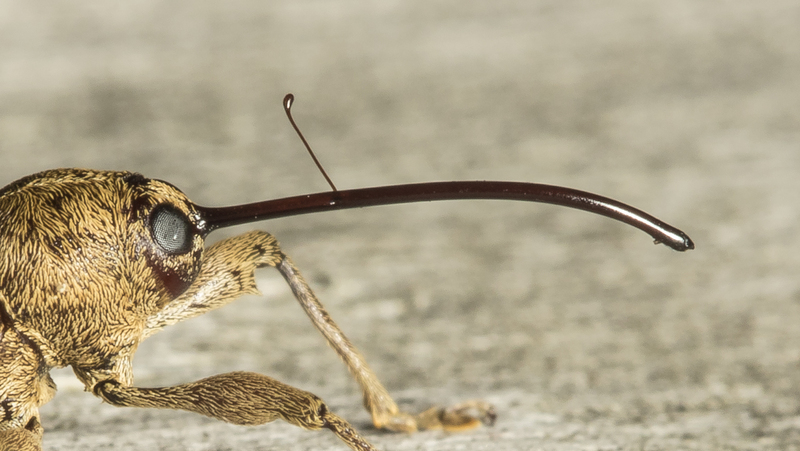 Their antennae are bent in the middle (geniculate) and are located about half-way down the rostrum. The basal portion fits into a groove in their snout when they are feeding. Their mouth parts are located at the tip of that long snout and are used to chew holes in plant material and, in the case of acorn weevils, through the shell of developing acorns. Females do this in summer and create chambers in the nut meat and then lays eggs into them. 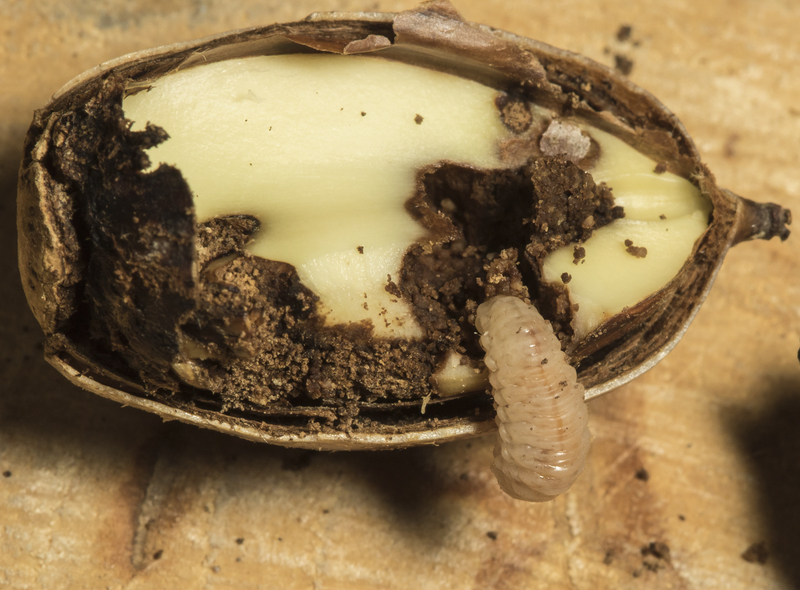 Eggs hatch in a few days and the larvae begin feeding on the acorn meat. From what I could decipher in various reports, it looks like larvae feed for a couple of weeks before emerging. I have found as many as three of the larvae in one acorn, although studies suggest those sharing an acorn may develop more slowly. 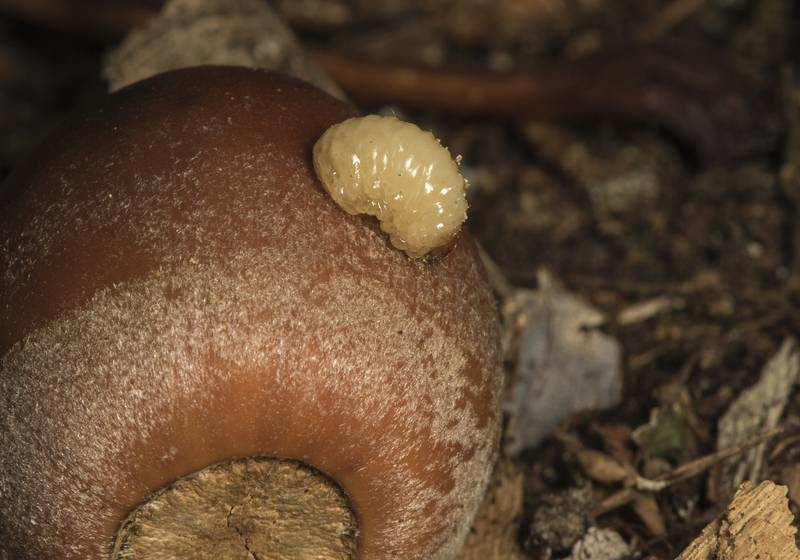 The grubs usually emerge within a few days after the acorn drops to the ground. While on our recent camping trip at Grayson Highlands, we were lucky enough to witness one emerging. Melissa looked down and noticed something white on the side of an acorn. When we realized what it was, I ran and grabbed my camera. Luckily, it is not an easy process, so I was able to get back in time to grab a few images as it struggled out. 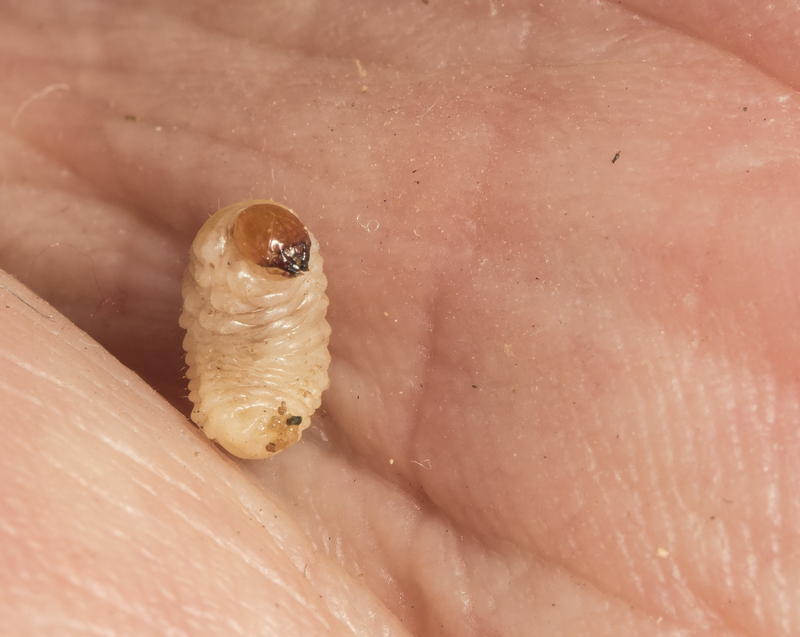 The larva chews a small hole that looks just large enough for its head capsule. It then must squeeze its chubby little body through this tiny hole by means of a series of gyrations and contractions. The grub finally pulled free and dropped to the ground. It immediately started crawling about, probing into the soil. I lingered and watched, hoping to see it disappear into the soil. But, it just couldn’t seem to make up its little grub mind as it would crawl, dig, crawl, and dig some more. I finally gave up and left it to its decision-making. I have since watched one dig rapidly into loose soil in a container I placed it in, so this burrowing behavior is likely influenced by soil characteristics. 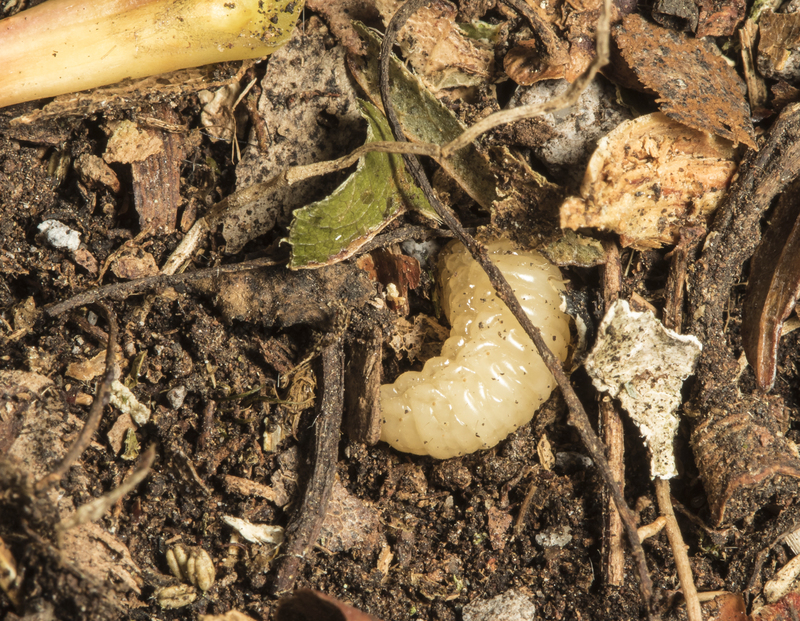 Online resources differ somewhat as to what happens next in the weevil’s life cycle. 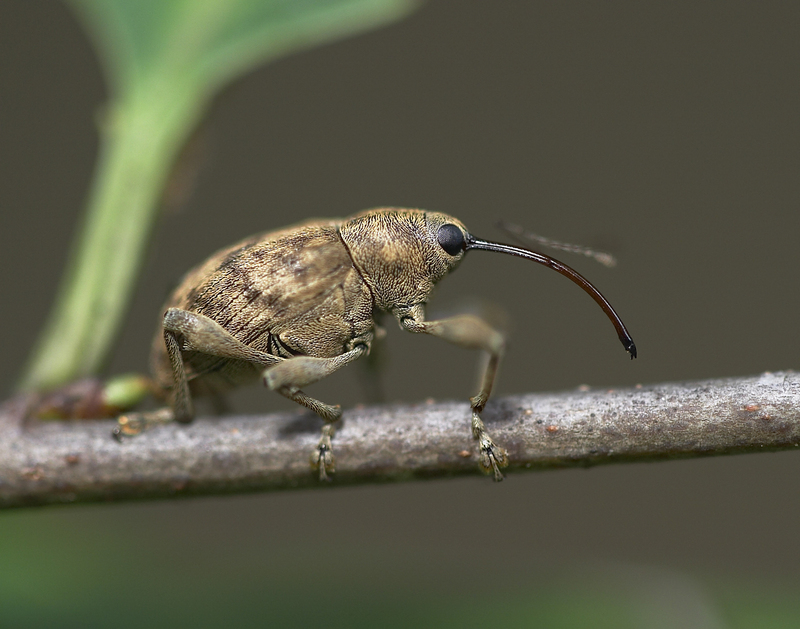 This may be because there are several species of weevil that lay eggs in the acorns of several different oak species, and they all may have somewhat different life cycle details. The grubs dig down into the ground and create an earthen chamber around them. They overwinter like this, pupate, and emerge the following summer, or, according to some sources, up to three years later. However long it may take this little guy to transform, we feel lucky to have witnessed this brief portion of an amazing creature’s life. Now, back to Thoreau’s observations…gather some acorns and drop them in water, and you will find there are, indeed, floaters and sinkers. Turns out there are several things that can cause an acorn to float – a cracked shell, fungi that has spread through the meat of the nut, or one or more species of insects that feed on acorn meat. All probably introduce air pockets into the nut and make it less dense. This also leads to another, albeit not quite as clear, indicator of soundness in acorns. Good ones (the sinkers) bounce when dropped on a hard surface like a floor; those with weevils or other “impurities” (floaters) drop with a thud and hardly bounce at all. “Sound” acorns contain dense white meat when opened. The “unsound” acorns usually contain some dark areas in their meat (or may be totally dark). 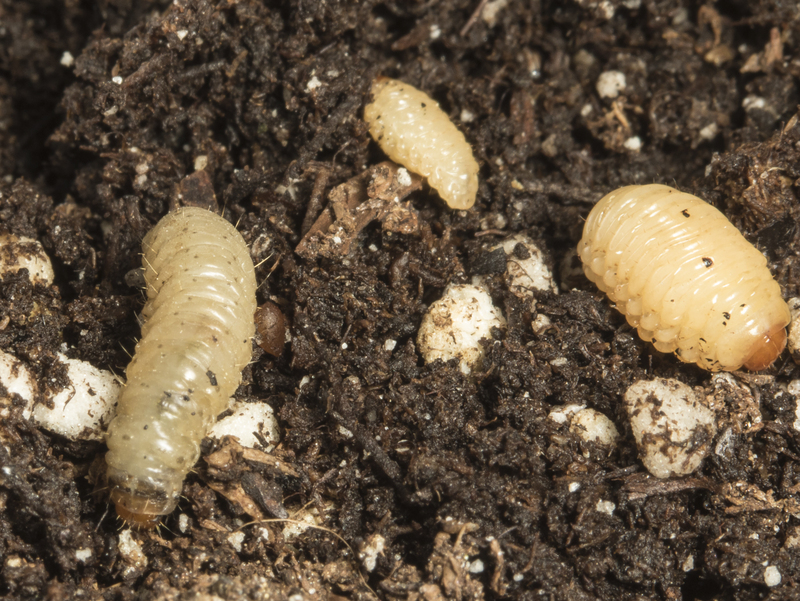 The two above show weevil larvae and their feeding tunnels, along with frass and some debris from feeding activity. 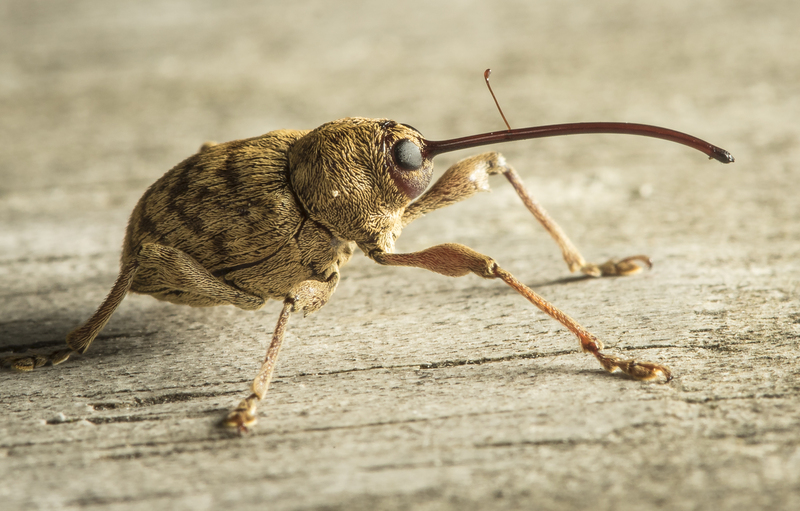 In researching for this post, I came across a recent blog on acorn weevils by Charley Eiseman, one of the authors of the excellent reference, Tracks and Signs of Insects and Other Invertebrates. This guy does some great work and he includes a wonderful video clip of a larva chewing its way out of an acorn…guess there is still more acorn watching in my future (and, I hope, in yours).